Matthew DeBord/Business InsiderThe last line of defence. 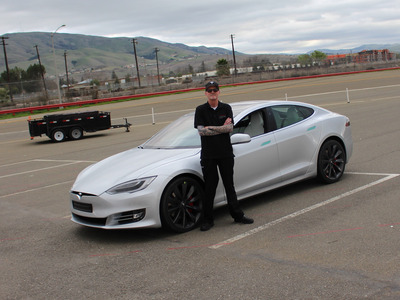 As a quality inspector for Tesla, Jeff Hickethier is responsible for test-driving Teslas as the electric vehicles roll off the assembly line. His job is to carefully study every car for flaws that might compromise safety or displease an owner. He’s been doing this for years and now teaches new hires how to be as obsessive about quality as he is. Editors Note: Business Insider had the chance to speak with four Tesla employees from different parts of the company to learn more about their work. And what we discovered were some of the coolest jobs at Tesla. We’ll be sharing the rest of the profiles this week, so check back for updates. How’s this for a great job? As a quality inspector for Tesla, Jeff Hickethier wakes up before dawn, jumps into his BMW 3-Series, nods toward the Audi R8 supercar that he saves for weekends, and sets off for Tesla’s test track in Fremont, California, across the San Francisco Bay from Fog City. Shaped like a tied shoelace, the test track consists of two straightaways with banked loops at either end. The Diablo Range looms to the east, and the view to the west is consumed by Tesla’s 5.3 million-square-foot factory, where assembly lines are churning out the Model S and the Model X – and will soon begin rolling the Model 3 in significant numbers from an innovative, highly automated new assembly line. 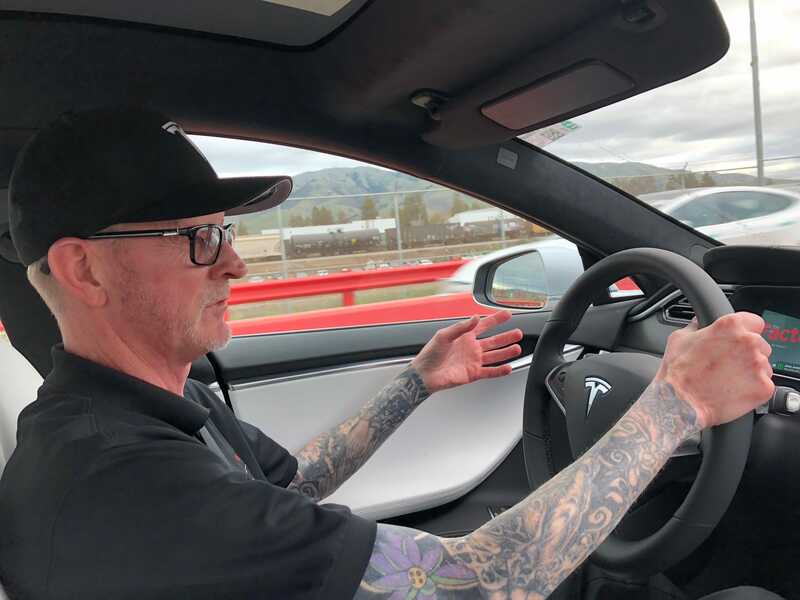 He arrives 15 minutes before 6 a.m., parks in the carmaker’s increasingly crowded lot, and heads for the track, a grayish-tan piece of aged tarmac that has been around since Tesla’s factory was jointly owned by General Motors and Toyota in the 1980s. 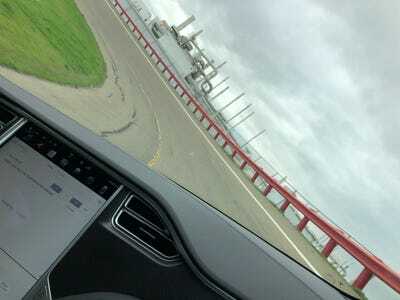 After some early-morning meetings and maybe a quick chat with an engineer, Hickethier, a wiry 50-year-old with full-sleeve tattoos and the laid-back draw of a Bay Area native, will spend the rest of his day outside, supervising the testing of Tesla vehicles as they emerge from the factory. Tesla tests at a far higher rate. “There are so many quality checks it’s ridiculous,” he adds. Matthew DeBord/Business InsiderHickethier at work. Hickethier, who has been with Tesla for six years, and a half dozen guys who work for him, put vehicles through a series of tests that are designed to identify critical flaws. Hickethier knows cars. Thirty years ago he started an aftermarket parts service out of his parents’ house. After bouncing around a few mum-and-pop shops, he joined a larger operation, ascended to management, saw that company close, moved to another operation, and eventually landed at Tesla, where rather than dealing with the public he drives freshly assembled electric cars and fusses over every detail. “The things that I find are usually not going to be anything that a customer would complain about,” he says. For Hickethier, there is no such thing as too critical. Nor pulling back. He’s the last line of defence for a carmaker that is under constant scrutiny, and he’s not going to take a pass on a rattle or creak just because he has been at this long enough to have hypertuned his senses to problems that probably won’t amount to much. There’s a Spartan aspect to Hickethier’s cheerful flintiness and dedication to what looks a lot like perfection. Tesla isn’t up against financial collapse, as it was in 2008; more than 100,000 vehicles were delivered in 2017, and Hickethier helped make sure they were as good as Tesla could make them. Matthew DeBord/Business InsiderThe Tesla track. But like King Leonidas, facing down a huge Persian army, Hickethier serves a Tesla that is winning despite overwhelming odds against it. Perfection is victory. You can’t work for the first new American car company to come along in decades, surrounded by powerful and far more experienced global competitors, and take it easy on quality control. For Hickethier, handing the stress is simply what he does. He runs each vehicle through a gantlet of challenges, ranging from strips of bumps and rusty chunks of metal to locate lose components or suspension flaws to speed runs around the track to double-check that a Tesla can live up to its reputation for velocity. All the while, he’s scrutinizing the car for the types of nearly invisible flaws that he has spent years calling out. He may have a trainee sitting next to him, learning the ropes, or he may be in the passenger seat, passing on his obsessiveness to the next generation. That’s not something that has gone to Hickethier’s head. But he does grasp his good fortune. Not that he makes a big deal out of it. 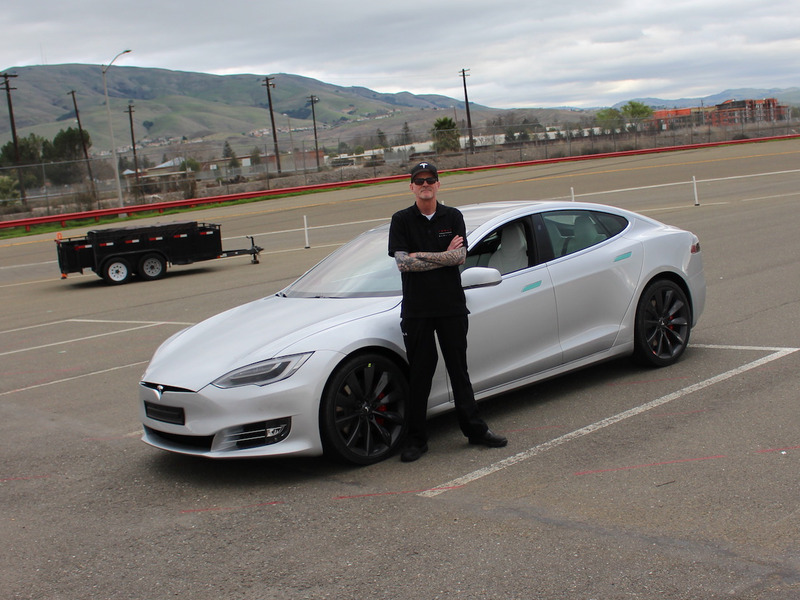 Asked whether he has the coolest job at Tesla, he offers a matter-of-fact verdict.